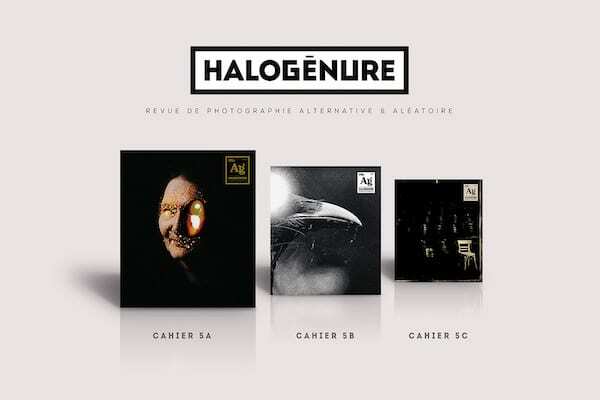 Halogenure #05 is available ! Dilengo has completed its transformation into Halogenure. A new shoot on new tracks our editorial board has sowed with the prospect of offering always more and always better. To the legitimate question about the very existence of a new review, there are several answers. To give visibility to authors not inclined to communicate about their work. To present coherent groups of works by artists who could otherwise only be seen remotely and isolated through hazardous browsing. To keep trace of images that would otherwise disappear from both walls and web with the time. Or is it simply to offer, in these days of reckless dematerialization, an object made of true and authentic paper ? There is no place in contemporary photography for false disputes aiming at equalling the quarrel of the Ancients and the Moderns. These disputes have been outmoded for years, poorly and artificially kept alive by small groups as over-communicating as they are uninteresting. The point is not to oppose analogical and digital photography; the two have stopped – for already quite a long time – being rivals and are now complementary. We have made our choice; still we encourage all forms of experimentations, exchanges and hybridizations, as long as they create sense and as they are not intended to mystify either the spectator or the market. We reproduce as best as we can artworks by persons whose approach and pictures appears to be interesting, while keeping in mind that a photograph only exists by being printed. Which is why we encourage to go and see in situ, and as often as possible, real photographs by real photographers, and to visit studios and laboratories. We also remind you that every domain in art, whatever it is, needs economic resources to keep existing, and that it is therefore essential to support, to the best of one’s ability, and by all means, artworks and artists one appreciates. Halogenure has a simple program. – To favour the visibility of all practices of analogical and alternative photography, whether in black and white or colours, poor or ultra-sophisticated, snapshots or pre-industrial negative, and this by gathering the best works discovered for you through our researches. – To assume the partiality of any editorial choice, and to give voice to photographers by organizing meetings and live interviews, and not by the mechanical publication of pre-established forms. – To allow the publication of articles that would otherwise not easily find an immediate echo in reviews and existing structures, too often subjected to their own agenda. – To create, with our publications, a zone for convergences, and to create dialogues inside our pages for visions which would otherwise never share a common space, whether it be artistic, geographic, temporal, social, or cultural. – To contribute by meetings and exhibitions to promote analogic and alternative practices. – To print our next issues on paper and to bet on a participative dynamic to finance. – and distribute a review entirely conceived and made by passionate persons for passionate persons. Wishing, above anything else, that you will enjoy the review.